This waist cincher by Rago is made of firm control Power Net fabric with 2-way stretch. Comes with 4 removable garters. 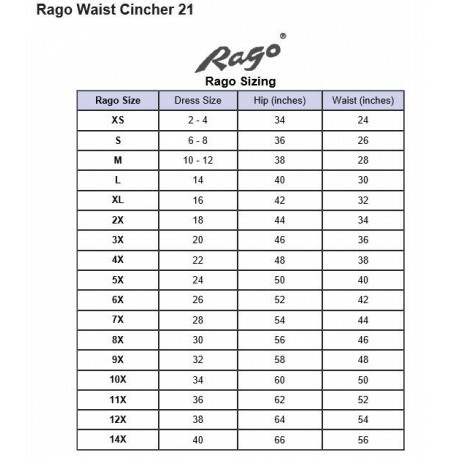 Rago Waist Cincher Style 21. This waist cincher by Rago is made of firm control Power Net fabric with 2-way stretch. Comes with 4 removable garters. Exclusive horizontal contour bands shape hips, waist, back and derriere. Flexible spiral boning for back support. Seams are sewn flat to help achieve a smooth look. Smooth surface - clothes do not stick. Front vertical hook-and-eye closure for ease of use. Available in sizes up to an 8x. Exclusive horizontal contour bands shape hips, waist, back and derriere. Front vertical hook-and-eye closure for ease of use. Flexible spiral boning for back support. Available in sizes up to an 8x.